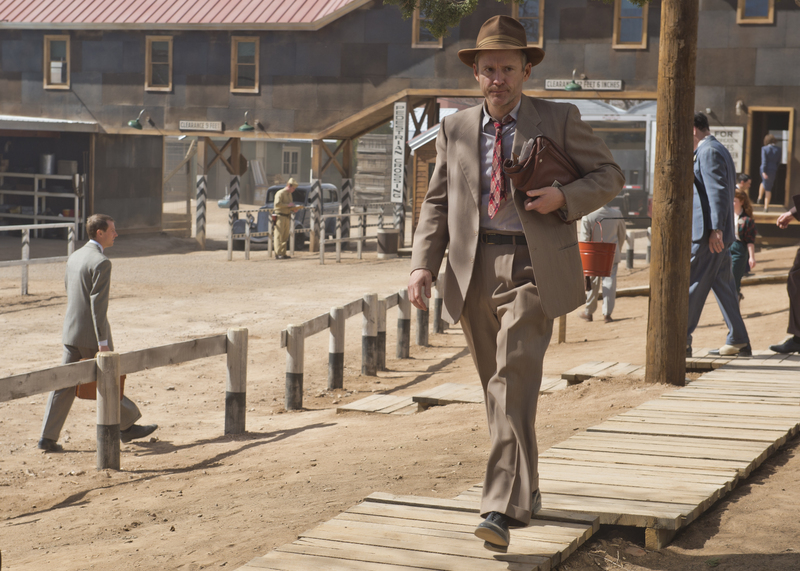 WGN America’s World War II period drama had a lot going for it — specifically, a talented cast and a fascinating premise. And it turned out there was plenty of material in the story of the men and women isolated in the New Mexico desert to create the atomic bomb that would end a war (at untold cost). Due to factors like the lack of major star power (Daniel Stern is perhaps the most recognizable name in the credits) and being stuck on a network most viewers can’t find in their listings, “Manhattan” never really permeated the ether. But the drama spun out of the true story behind the invention of the atom bomb is legitimately fascinating, and if enough viewers get a chance to discover the show via digital platforms like Hulu before the second season premieres next year, the show could truly get a chance to shine. We’ve already written extensively about how the “Last Week Tonight” team has taken the host-behind-desk format and made it into something special, but just to recap: This isn’t just “The Daily Show” with swears. 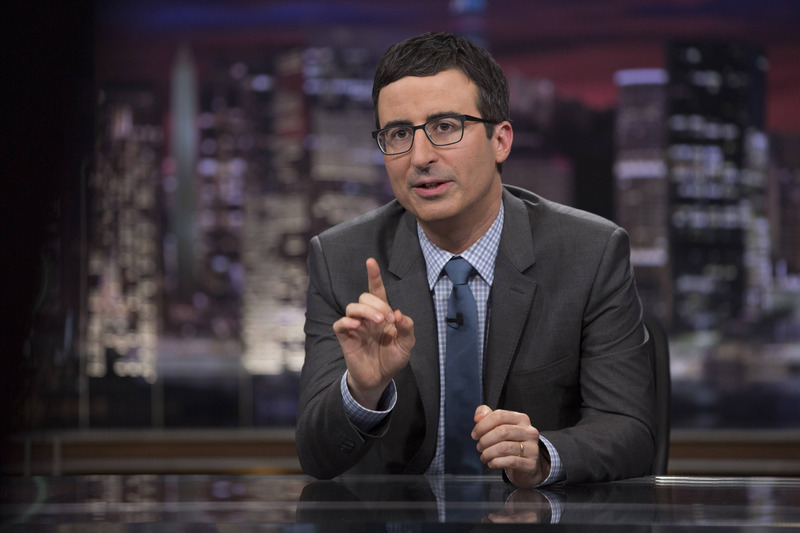 John Oliver heads up something vibrant, lively and relevant on a level that network late night just isn’t achieving — even though it could be. What has us loving “Last Week Tonight” isn’t its ability to go X-rated or its ability to tackle tough issues; it’s the no-holds-barred approach that starts tough conversations and creates hilarious moments. Come for Dog Supreme Court — stay for some real talk about our world. Though “Kingdom” is easily the most difficult to find of all the shows on this list, seeing as it’s only available to DirecTV subscribers, its limited available audience does nothing to hinder its story. Tracking the lives of an MMA family and the gym they’re trying to keep running, Byron Balasco’s gritty tough-guy drama has a pure heart beating underneath its admittedly off-putting exterior. Even sports fans haven’t fully warmed to the brutal fights of mixed martial arts, so expecting art lovers to flock to watch these ruffians’ story seems far fetched. Yet Balasco and his team draw from the best, wisely injecting a family dynamic among the core characters and never letting any of them hide behind their flying fists and feet. “Kingdom” is more of a character study than anything else, and that makes every moment fascinating. If you can find it, don’t be shy. Why was a show about a talking horse one of this year’s most affecting human shows? Damned if we know. 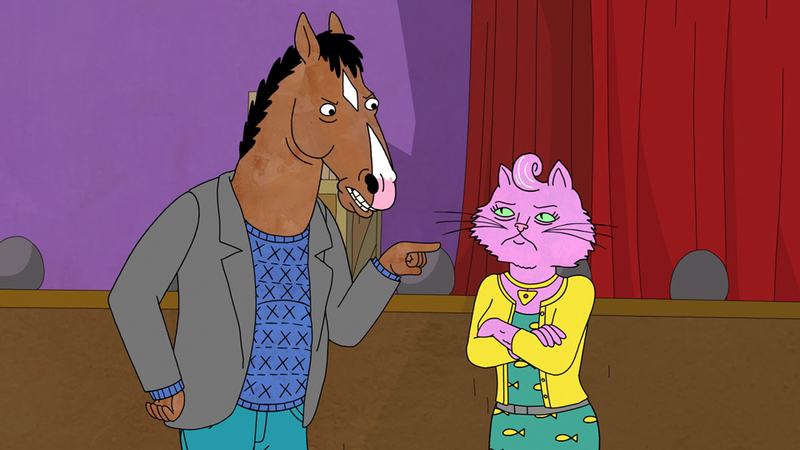 But “BoJack Horseman,” in all its weird animated glory, proved to have a surprising amount of heart despite its crass take on the entertainment industry and the faded glory of the multi-camera sitcom. It also had maybe one of the best voice casts of an animated series in recent recollection — beyond regulars Will Arnett, Amy Sedaris, Alison Brie, Aaron Paul and Paul F. Thompkins, guest stars included Anjelica Huston, Stanley Tucci, Olivia Wilde, Patton Oswalt, Margo Martindale, J.K. Simmons, Kirsten Schaal, Stephen Colbert… Some of those people have won awards, but more importantly they brought credibility to what proved to be one of the most emotional series released by Netflix. BoJack may have been a horse, but he was also constantly struggling with the question of what it means to be a good man. In the first season, he might not have found the answer — but the journey grew into one worth following. Amazon Studios put itself on the map this year with Jill Soloway’s “Transparent,” a delightfully original treat of a black dramedy depicting one of the most complicated families on (and off) television. 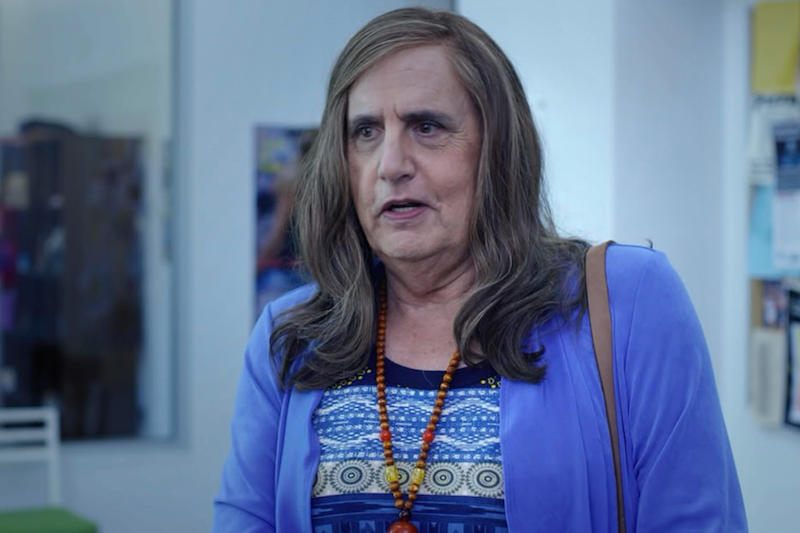 Jeffrey Tambor plays Maura Pfefferman, a transgender who comes out to her family after repressing her true self for too many years, with enough lust for life to make anyone fall for her. But the rest of the cast is given the difficult task of remaining real through some taxing times — and I don’t mean coping with their father’s confession. Each of Maura’s three adult children are agonizingly self-centered, hindering her process more often than they help it. Yet she needs them, and they clearly need her. It’s this complex web of family necessity that keeps “Transparent” together, and, more importantly, what keeps you coming back for more. Next: Raptures, virgins, affairs and accents. 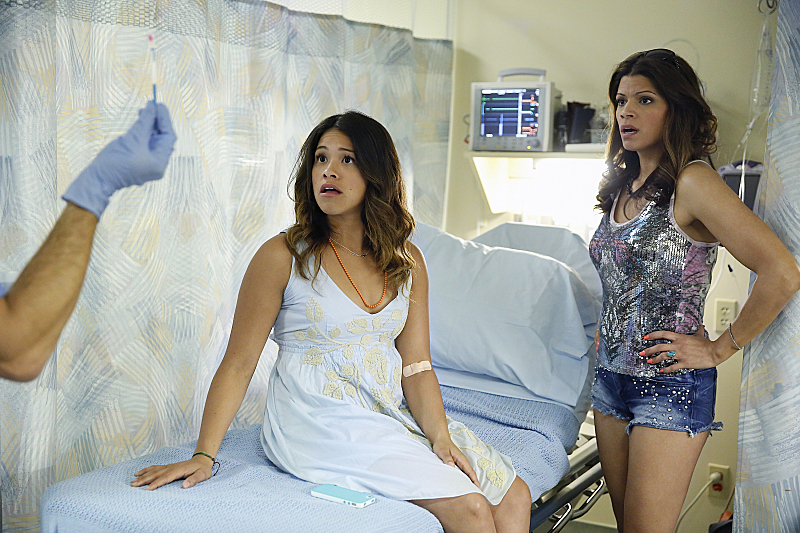 When “Jane the Virgin” got the CW its first Golden Globe nomination for Best Series, no one questioned it — which, given how contested the Golden Globes can be on a regular basis, says a lot about the respect this sweet-natured telenovela riff has garnered in its first half-season. Star Gina Rodriguez anchors a dynamic ensemble cast rich in diversity and uniqueness — I’ve grown increasingly impressed by diabolical-yet-sympathetic Petra (Yael Grobglas) — and its original source material (the Venezuelan series “Juana la Virgen”) is well-served. Watching “Jane” can sometimes feel soapy, but there’s no guilt in this pleasure. It’s smart, character-driven entertainment that doesn’t fear exciting twists, legitimately funny moments of comedy and real emotion underneath the heightened drama. It’s easy to dismiss stories about white privilege and the problems brought unto those possessing it. It’s even easier when those people bring the trouble onto themselves, through sheer boredom and ineptitude. But if these were your reasons for avoiding Showtime’s layered new thriller “The Affair,” it’s time you take a second look. Sarah Treem and Hagai Levi’s soon-to-wrap first season is at once a condemnation of such people and those who reject them. Tracking the lives of one frustrated author, husband and father, as well as a waitress, wife, and mourning former mother, the drama is told from their dual perspectives to a detective investigating a possible homicide. Each story is slightly altered to reflect the narrator’s jaded perspective, and it’s up to the audience to determine who’s lying and why. Underneath this well-executed format, Treem and Levi take on judgement as a question by forcing audiences to second guess what reasoning is good enough, what isn’t, and who’s the person really on trial here. No one is off the hook entirely, and that makes for some truly honest TV. If you can survive it, it’s worth it. This may as well be the mantra not only for HBO’s latest drama, but also for the characters within it. Citizens of Mapleton, NY are asked to keep on going despite losing 2 percent of the world’s population without warning or reason, and, frankly, that’s more than some can bear. Based on Tom Perrotta’s novel of the same name (and covering all of it in the first season), Damon Lindelof’s latest appropriately revolves around a big central question never to be resolved, but it’s really about individual crisis of faith found when the question is forced into their lives. How will you react to the unknown? The answers may surprise you. This year, we had to stop using “announcement of a TV show adapted from a movie” as a drinking game scenario, because our livers got mad at us. And not only is the concept a tired one, but many of the resulting projects have been less than good (remember “Bad Teacher”?). 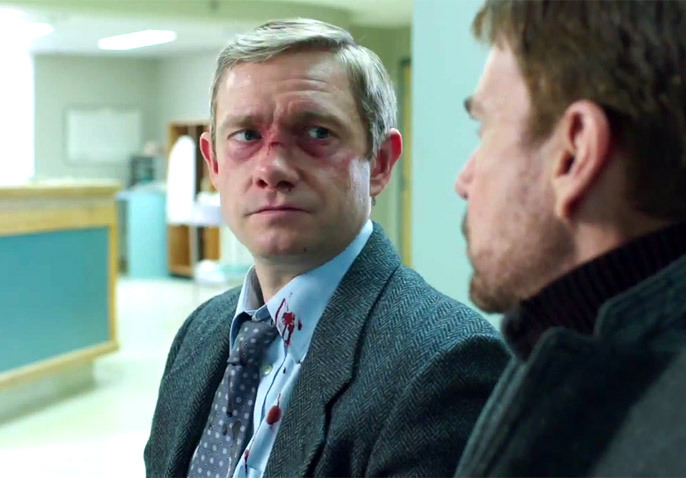 But by using the Coen Brothers’ 1996 cinematic masterpiece as a thematic inspiration, “Fargo” creator Noah Hawley ended up writing a show that captured everything valuable about the original film, while delivering one of the year’s best crime narratives as performed by one of the year’s best casts. The next season, featuring a new scenario, a new time period and new stars, may suffer by comparison. But we’ll always have these ten episodes of dark comedy and darker drama. Ranking new shows tends to require more than just stating personal opinions as facts. By pitting shows against one another in a battle royale, authors are endorsing one program more than another. They’re telling readers to spend their time on this show rather than this one, or at least this show before this other one. The practice requires a bit of guesswork because once someone starts a show, they usually won’t stop until it’s over (given they like the program). How will the next season compare to the first? Are the paths to success written into what we’ve already seen? Will it be as good as the original? Can it? These questions surround “True Detective” as well as the other shows ranked above it, but its inclusion at the top of the new shows list is at least partially influenced by the anthology structure of its series. 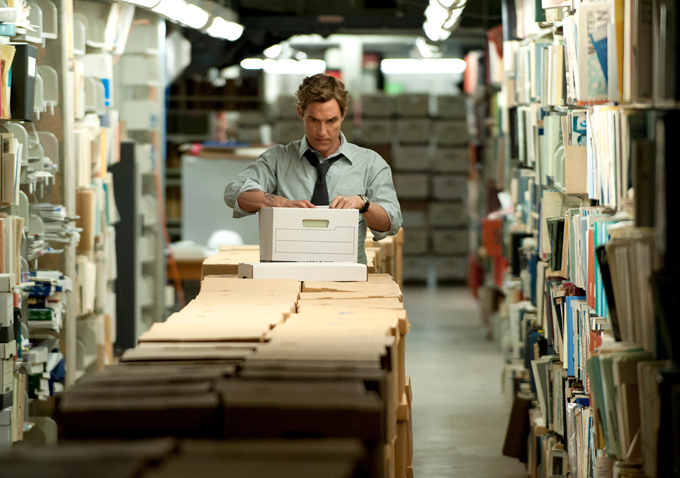 Viewers don’t have to watch Season 2 to get fully wrapped up in the 1995 casework of Rust Cohle (Matthew McConaughey) and Marty Hart (Woody Harrelson). It exists in its own world and will forever remain that way, no matter what Season 2 has in store. 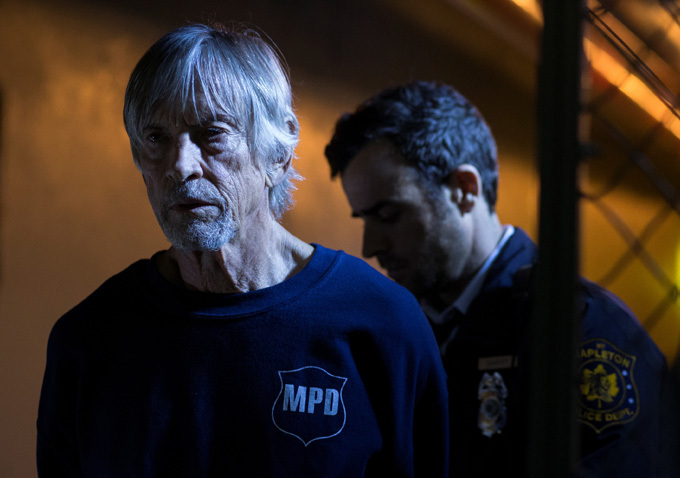 Director Cary Fukunaga’s ambition as well as writer/creator Nic Pizzolatto’s captivating dialogue have created a perfect season of television, and nothing can spoil it. So dig in without trepidation dear readers. Only the truth lies within. Tomorrow: Most Shocking TV Moments of 2014!